is sent from Yonezawa to the whole country, and to the future. Thanks to research results about ecologically responsible lighting, and thanks to our long-standing production know-how, we are able to produce and distribute lighting equipment since October, 2010. 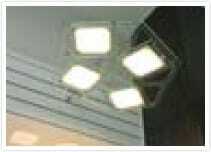 Through LED and organic LED lighting equipment, our company contributes to a more responsible treatment of the environment, and to a reduction of energy costs, too. Especially for the industrial sector, we are developing, producing, and selling original articles for LED lighting. Security lights for outdoors, floodlights; the number of products growing continuously. Consultations for development of customized articles and OEM is available. Yonezawa is the basis of organic LED research, and our company has long been concentrating on the cooperation between research and production. 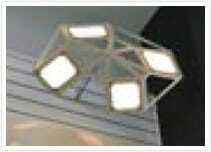 Besides producing organic LED ighting panels in large numbers, we are offering organic LED lighting utensils.